Last year at SteemFest, @ned and @sneak announced an exciting new Feature that is coming soon to Steemit. At a technical level, a community will start out as a 'regular user' account and will be converted into a community. The reason for this is so that communities can eventually share in the revenue from the posts that are created within them. When a user creates a post within a community, it will still be posted under their own account on the blockchain, but it will have JSON that designates it as part of a community. Communities will eventually support payment splitting, where a portion of the posts reward is shared with the community account. Community admins will be able to set this amount as a percentage (from 0-100). When enforced, a post will only be allowed within the community if the author shares the required percentage of the rewards with the community account. We are proof that this proposed model for communities works in reality. Not only are we rewarding our members who write good content, but we are helping to raise awareness on a very sensitive issue and by doing so we are creating solidarity and unity which is the foundation of any healthy community. This community is very lucky, we've had a huge head start, in more ways than one. We have a whale on-board who goes by the name of @canadian-coconut. When @markwhittam first approached Ca-Co with the idea of building an awareness group it was a little rusty to say the least, but with the help, belief and guidance from Ca-Co we finally came up with a working model. Thanks to Ca-Co we are NOT called ONE VOICE! (sounds more like a boy band) instead we settled on @familyprotection because of the current governMENTAL "child protection" rackets were not focused on protecting families. On the flip side we also have a lot of takers who claim to be loyal members but in reality are just here for the payout, you know who you are! Here is a visual of how this community works. "Child Protection" Agencies are Taking Children Away from Loving Families. 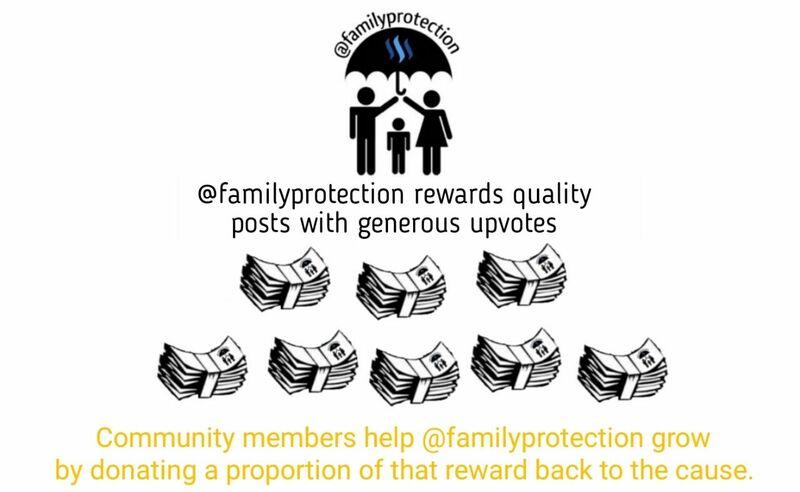 When one of the volunteers @familyprotection upvotes and resteems a post, they always include a comment that explains that the post was chosen by our community, and that if they wish to support our community with our goal of saving funds to Help Families in Need, than please donate a portion of the SBD rewards they receive from this post. Some of those funds are in our Bitshares DEX wallet, which we chose because it offers accessibility to a basket of crypto-currencies and most importantly is TRANSPARENT. Our Bitshares wallet name is family-protection, and it now includes investments in Bitshares, EOS, Litecoin, OMG, and others. As we expect 2018 to be "The Year of the Crypto," by the end of 2018 we should have a very nice nest-egg to start really helping families that are in dire straights and to spread awareness of the issues at hand. THANK-YOU to the Steemit Visionaries and Developers for offering the opportunity through Steemit to make a HUGE difference in the world and in real people's lives. THANK-YOU to all the Community Members at @familyprotection who have gladly and freely donated of your earnings because you care about the future of our children and the state of this world. I am short of words and my brain is dead silent right this moment, but my heart "KNOWS" that we are on the right path. Many thanks to Ca-Co, the sweat and heart you put into this struggle is beyond words and you are more than just a Lady, you are A shining Inspiration!. What can I say about Mark that isn't already visible!, you are great Buddy and your heart is rare, of all the numerous project you could think of initiating, you chose the one that Gives Children a future and families hope, I can't see any road that is better than this. Thank you!!! The @familyprotection community would be unstoppable because of us all, everyone of us that has looked beyond the colors, classes, races and our differences, we would be the positive frontier to every piece of FamilyPreservation. Thank you @kryptocoin for your kind words! Yes! I feel that we are most definitely on the right path, and it's because of people like yourself who go that extra mile. I know me and Linda have worked hard to get to this point but I would say you are just as much a part of @familyprotection's success than any of us! Hi @kryptocoin your opinion is gratefull. I agree what you say in the comment. Hi everyone! pls do help to upvote this post for my friend's father's heart. They need our support right now..
Meeting @canadian-coconut has been one of the highlights of my steemit career, there is no one on the platform with a bigger heart and a more passionate soul, (though I will certainly give @markwhittam a close second). We are all indebted to the efforts of these two individuals for everything they do here, Heroes of curation, but more importantly heroes for anyone who struggles against the tyranny of the system. Thank you so much guys, what a fantastic way to show how the communities feature will work! Out of all the places ive found on steemit. This community is one that is to close to home not to get heavily involved in. As a canadian, as a father and as someone who sees all the wolves under the wool. I want to help make the world better. So i want to start with my own country. We need to have a blockchain dedicated to children in the system. So we can validate potential homes and placements based on their uniqueness and the needs that they will uniquely need. Scrutiny, privacy, security, we need to push for our governments to reinforce the potential of distributed ledgers in the child care system. Abuse is rampant and kids are sufferingg as i type this and it burns my heart knowing im too poor as an individual to do anything substantial. Im not educated enough to write up a code so that know your child, know your caregiver, know your adopter are all seemlessly integrated. No coins no pump and dump just a ledger system. To keep kids safe. im here for @familyprotection because i want to exist in this community. Much love. I hope i dont sound ignorant i just type what my heart says.. This is stunning news. Thank you. This will mean that you guys have more time - thank you all up to now for all the hard graft you have put in to create and keep this going - I'm now going to be dedicating most of my daily 11 upvotes now to familyprotection. Resteemed. It feels great to be a part of this community! and even better that we have the support of people just like you! When the people are united, We are unstoppable. Definitely, Linda has put in a lot of work in this project and, personally, I'm amazed how does she find the time to follow up on stories and engage with the community. 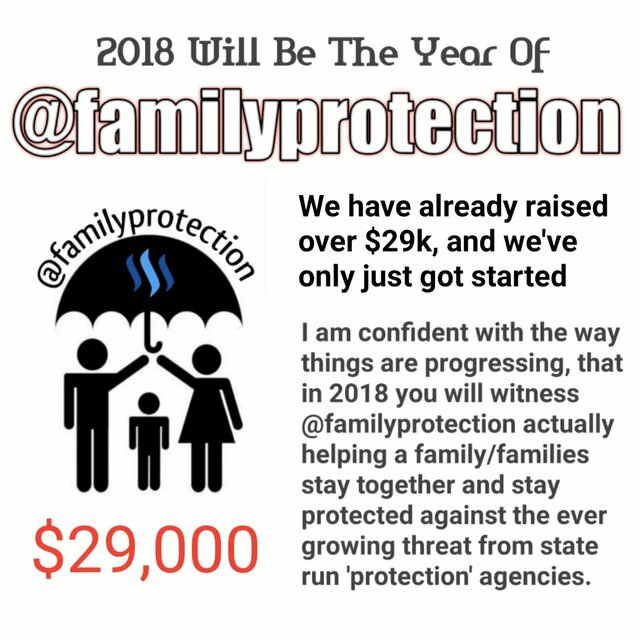 Let's hope this year will be good for cryptos, so that the @familyprotection account can grow big enough to make a difference. Yes! I'm starting to think the @canadian-coconut is a bot because her (It's) curation game is by far the best on steemit! I totally agree! Sometimes i think she must have a time machine or something. Linda should write a book on how to curate!! Looking forward to the communities platform. Hopefully it's not to far into the future. Hahaha! yeah I still look back and cringe that I actually wanted to call it one voice! Thanks again Linda! keep up the good work. It was definately a good idea. Many families struggle with the dark side of western society, and exposure to it is critical. @familyprotection is a light in a darkened world. Together we can all make a difference in the lives of families and children. So good to see @familyprotection doing so well. It really is a great example of what can happen when people come together and stand for what is right. There is such a need for this in the world and I know we will see it continue to grow. Thanks so much @markwhittam and @canadian-coconut for creating this and making it what it is today, Family protection is Unstoppable! 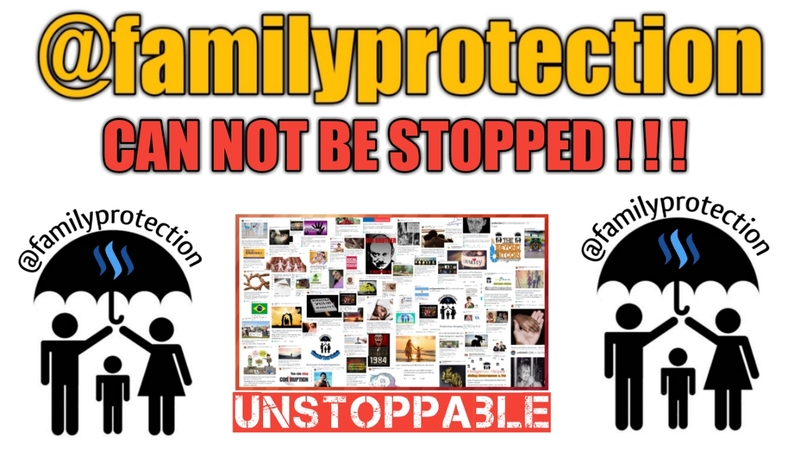 Family protection is unstoppable thanks to your extremely hard work @markwhittam and @canadian-coconut you put into this and of course your huge hearts. 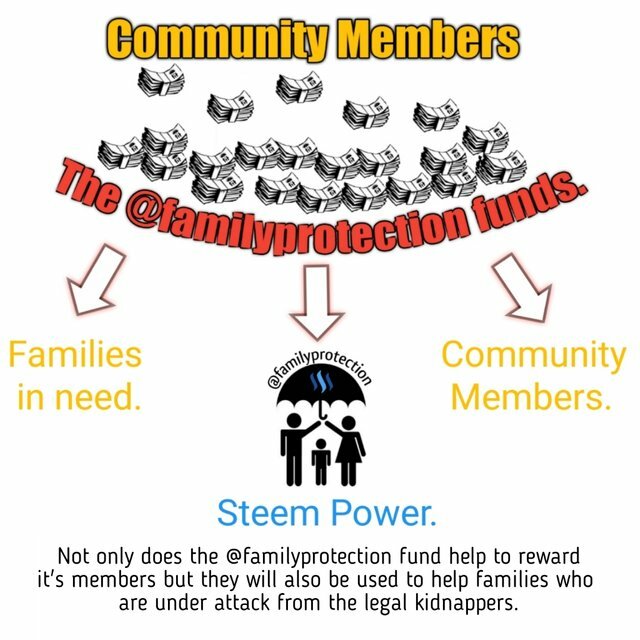 You guys are the steemit heroes for the families. Incredible news!!! Does this mean @sneak has called off the flag attack? hahaha! you would think so! I honestly think he thought we was a voting ring so his reaction was kind of understandable, I know that I have also made similar mistakes when calling people out on their voting behaviour, It just shows how much we care about steemit! I am not condoning this behaviour but I do get it! I guess my heartfelt plea fell on deaf ears! His flagging did stop so we are hopeful that he now understands what the Community members have expressed. That would be wonderful... I'm trying to take a little time to unwind, plus several of us are in the process of introducing Dr Corsi from InfoWars to Steemit. I'll try to be back on track tomorrow! This is my very first week on Steemit and I'm already in love with it. Everyday, I keep exploring it more and more and have followed some amazing blogs and you're the new addition on the list. I'm your 1037th follower. Your vision is great and I believe the issue that you're creating awareness about is related to each one of us. I'm just a minnow, don't know how can I contribute to your cause other than upvote...may be through a post? Please guide. All the best wishes to you in this year and ahead. You are welcome to post any relevant posts, memes or videos you have made about CPS under our tag. If it is something very simple or not totally our cup of tea, it may not get a huge vote or a resteem, but you are certainly free to post it. Thanks for caring about this issue! You're right; you have. In part because of energetic supporters like @richq11 . Do you have any advice for someone who wants to form a proto-community around a different subject or issue? 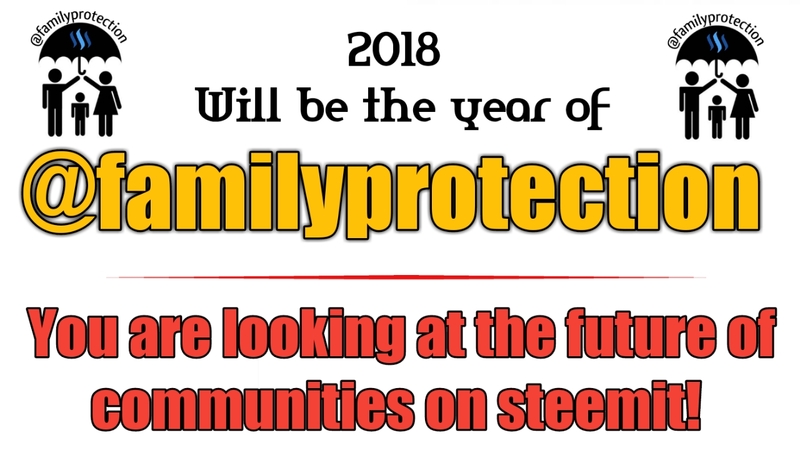 @familyprotection the community you have built here on Steemit is very inspiring, and as an activist I need to pay attention to what you are doing and how you are doing it here on Steemit. Although I am not 100% clear on your model here on Steem, the major flaw I can see is not being able to hodl all of your steem because you have to cash some out for the charity. Keep up the great work! You will earn WAY more steem by choosing the 50/50 option on your posts. the 100% power up option is only a good choice when the Steem Dollar is around USD$ 1 -- but right now it is $3.50. So when you get your 50/50 payout, you can transfer some of those SBD over as a donation, and then use the internal market on Steemit to trade the rest of your SBD for Steem, and then power that up! You will be left with more powered up Steem even after your donation, than you would have had if you had chosen the 100% power up option in the first place. I love it. My only suggestion is can you change the word "can" to WILL. dear @familyprotection i want join in your community. the work the community is doing is really impressive. Keep the support for good families and the kids up!. Steemit is very powerful and you're doing the right thing. This will inspire many. All the best wishes to @familyprotection and @Canadian-coconut. Shared with my followers. Happy Steeming! Congratulations @familyprotection, this post is the eighth most rewarded post (based on pending payouts) in the last 12 hours written by a Hero account holder (accounts that hold between 10 and 100 Mega Vests). The total number of posts by Hero account holders during this period was 393 and the total pending payments to posts in this category was $6539.79. To see the full list of highest paid posts across all accounts categories, click here. I just know, here there is a community like this. very amazing @familyprotection, eager to be part of this community. Love being a part of this group and so happy to see it growing. People need to know the truth and this is one of the best places that is putting the truth out there. It's time to stop turning a blind eye to what is going on with the children. I really like and support this idea of @ned and @sneak. Just want to know will this payment portion be deducted from the remaining 75% of the posts? @canadian-coconut, You're doing a fantabulous job! Steem On! You are really amazing. You doing really great jobs.Thank you so much for doing amazing works. This is just great and your passion to lend a hand not just to selected few but to anyone especially those families that are in dire need. I am just a starter here in Steemit, from Philippines, how would I be able to be involved on your community projects? It is a good cause and a very noble community to help so many people in the future, I really like this community with the aim of helping people who need help later. This post was upvoted and resteemed by #thethreehugs. Thank you for your support of @familyprotection. #thethreehugs is currently donating 40% of "ALL" post payouts to @familyprotection. @familyprotection We can build a tower of ideas and turn them into reality, if we focus on what we want it sounds like something that only happens in movies but the truth is that in Steemit dreams can come true, with motivation and vision to the future to achieve what we want. Within Steemit there are endless projects that have great ideas, others that are in full growth as well as some projects with more humanitarian purposes that really leave the name of steemit at the top of the world filling the entire community with pride . These projects generate enough energy in this platform to continue working on innovative projects. This brings a great responsibility, since our most loyal followers are waiting for good content and ideas that can help us grow as a group and we can share this knowledge with the other users that make up the Steemit family. I have been working for a few months on a project called Dudeland (Land of Friends) for communities that need support to move forward and grow, opening our hearts to leave indelible marks in their lives. It is an Active and Constant project that is generated from the interest of the steemians in contributing a grain of sand in this sea of ​​opportunities. The communities and institutions that have been supported by the Dudeland Project (Land of Friends) have benefited from donations of food and school supplies for the little ones. I have been looking for more support, to achieve bigger things and reach other communities, where many things are needed, I not only look for support for my small project but also that support that other users of the platform need and who are contributing their grain of arna to build a better venezuela, grcias to Steem! I remember the first days of @familyprotection. Very happy to see that it grow so fast and naturally and so many people support it and it helps the family which need it truly help.